England's world number one Mark Selby beat China's Ding Junhui 18-14 to win his second World Championship title. Selby, the 2014 winner from Leicester, led throughout Sunday and went into Monday's final session leading 14-11. Ding, who was bidding to become the first Asian player to win the world title, claimed three frames in a row. But Selby dug deep to seal a brilliant double for the city of Leicester, whose football team became Premier League champions 13 minutes earlier. "It is fantastic," Selby told BBC TV. "It was very special to win it two years ago, but I felt under a lot more pressure now than I did two years ago. "In the first to 18, a 6-0 lead is not a huge one, especially against someone like Ding. He played fantastically earlier today and I had to just hang on to him. "I'm just over the moon. I saved my best performance for the final and I only had two good sessions in the tournament. Luckily my 'B' game is pretty good. And on Leicester City's incredible Premier League title success, he added: "To be Premier League champions is a fantastic achievement and I want to say well done to Claudio Ranieri and the boys." 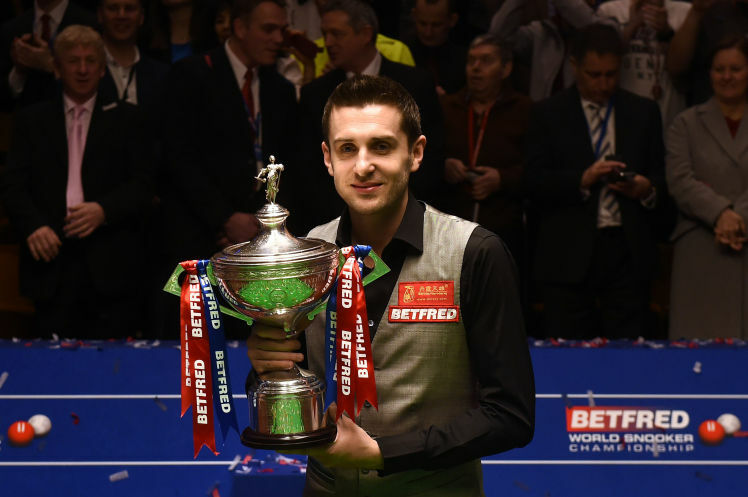 Selby joined snooker's greats by becoming only the sixth multiple world champion in the Crucible era. The 32-year-old, who pulled out of the previous two ranking events in preparation for the season-ending showpiece, had not played his best snooker in the tournament and came in for criticism over his often slow and meticulous style of play. But breaks of 120, 91 and 76 put him 6-0 ahead on Sunday, a lead which he never relinquished. Having played the longest frame ever at the Crucible against Marco Fu in the semi-finals, Selby was involved in further drawn-out tactical battles with play ending at 00:24 BST on the first day. However, Selby - who has remarkable mental toughness and never-say-die attitude - showed his experience to close out the match and the seventh ranking title victory of his career keeps him top of the world rankings for a fifth straight year. John Spencer, Alex Higgins and Ray Reardon won the title in both the modern and pre-1977 era. China's Ding fell short in his bid to become only the fourth player from outside Britain to win the title and only the third qualifier to lift the trophy. The 29-year-old previously failed to deliver his best at the tournament as two semi-finals were his best showing, but with less pressure of not being one of the favourites this time, he managed to showcase his talent with his renowned heavy scoring. His 15 tournament centuries was only one short of Stephen Hendry's all-time record. They included seven tons in the semi-final win over Alan McManus, a record for a single Crucible match, but he was then overcome by nerves during the opening exchanges against Selby. Although Ding, who moves up to ninth in the world, got to within one frame at stages in the final, Selby displayed his trademark grit and resolve to pull away again, leaving Ding frustrated. 1991 world champion John Parrott: "Mark Selby is made of granite. He is a tremendous competitor, his B game gives headaches to others, and he doesn't waste a shot. When he gets his scoring boots on he becomes very difficult to play against, and when he's not scoring every shot has a purpose. "The way he went over the winning line is the sign of a true champion, that final break was one of pure class." Six-time world champion Steve Davis: "Ding Junhui has inspired another generation of players in China. When they have seen the character he has shown, it is not a failure. There will be a Chinese champion somewhere down the line. It's been a fascinating tournament. It's great to see there is strength in depth within the players."